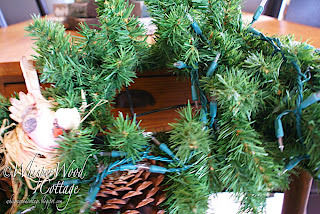 reaths are not just for the holidays any more! I found the wreath below...lights and all...at a garage sale last summer. For $3, I thought I'd lug her home and see what I could do with her. She was sitting in the garage for the past however many months...beleaguered and lonely. Are you loving the faux pointsettias? I didn't think so. When I found this basket of dried hydrangeas...all for $10...basket included...at an occasional sale in November, lightning struck...I knew what to do! I thought I'd try my luck at something crafty (definitely not my forte!). Remove the faux pointsettias. 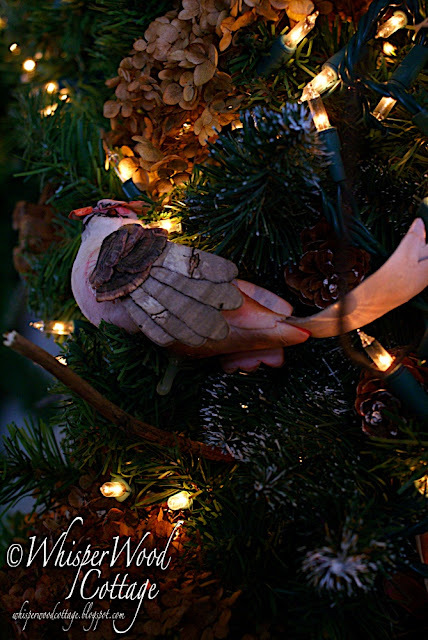 I kept the pinecones and bird in place. Move the branches apart to create an opening in which to insert the hydrangeas. Break off any unnecessary part of the stem. I took about half the length off. Insert the hydrangea blossom into the opening. Repeat steps 2-4 until you are happy with the appearance. 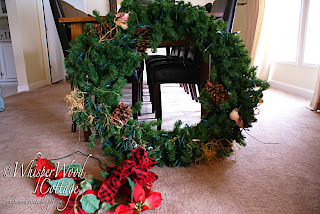 Take the stems that you broke off in step 3 and insert them randomly around the wreath. Hang the wreath, plug it in, and enjoy! There you have it! 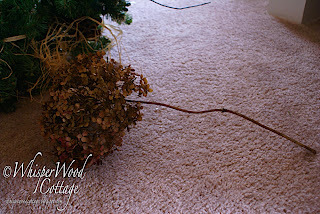 From faux poinsettia tacky to dried hydrangea elegant in the matter of minutes. 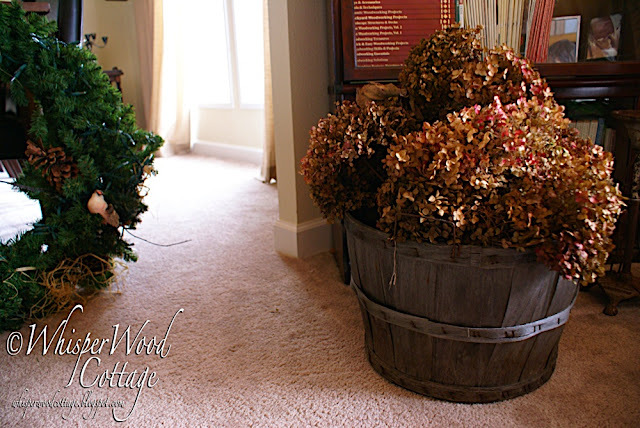 Hydrangea and pine: a wreath for all seasons!! It will add some earthy warmth and light to WhisperWood Cottage over the wintry months with below zero temps ahead. Amy, you little craft dog, I love it and it looks like you spent a fortune on it! Nice way to spruce up that $3 find! I'm blown away by the fact you bought that whole basket of hydrangeas for $10...you are one savvy shopper! The wreath turned out gorgeous and only you and your fans know the truth...and we won't tell! Your lights even work!!! Aren't you clever? I'm with Trash Talk...kuddos on the price of the hydrangeas! No wonder you are nominated for awards! Great idea, Amy! Looks wonderful hanging in your room!! Wow! It really was an uglyish duckling before and now it's a beautiful, elegant swan. Great job!! What an amazing transformation. Really beautiful and so creative. Thanks for sharing!! Garage sale finds are the best! Can't go wrong with dried hydrangeas anywhere!! I love hydrangeas...that is a great idea!!! I just let mine die out there in the fall =( I should have saved them. Very nice! What a gorgeous difference! I love it. How long are you planning to keep it up? I love hydrangeas and have three bushes in my yard I harvest each year! I will definitely be keeping my Christmas stick wreath now! Great idea. The little bird is a nice touch. Very nice! Amy... that is one grand transformation! Thanks for sharing... I think I'll snag this one and make it my own! What a pretty wreath and how clever of you! And for such a reasonable price -- looks much more expensive! Wow, I love that idea! 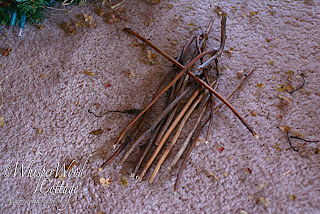 I have tons of dried hydrangea hanging around... now I just need to hit the thrift shop for a cheap-o wreath! I love the wreath. I have all the materials and will try my hand at it this week. Thanks for the ideas and inspiration. Thanks for sharing your and linking up to SNS! Your wreath is beautiful. What a wonderful idea. Thanks for always inspiring us. 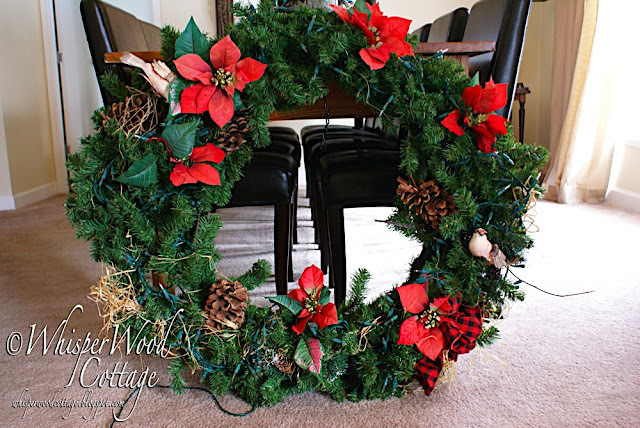 Very pretty winter wreath! Great job! It's just a truly gorgeous creation! Beauty..love it. I am so partial to dried hydrangeas. Love the transformation. And I love wreaths! What a great transformation. It is very cute! The evergreens and the dried hydrangeas are a perfect pairing. That could work right on through early spring- so pretty! I love it. So pretty! 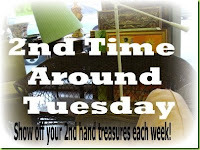 I just found your blog from Thrifty Decor Chick. Great tranformation, I used some hydrangeas from my yard, on one of my Christmas trees this year, but I never thought about a wreath. I will be saving allot next of them next year. This is lovely! Wish I could grow these -- I may try it again this summer. Just beautiful. Oh how I love the hydrangeas and twinkly lights! What a creative idea, Amy, thanks for linking up! What a great transformation. Your wreath is just gorgeous..
Amy, what an amazing transformation! Your wreath is perfect for the winter months ... Those hydrangeas were truly a treasure! 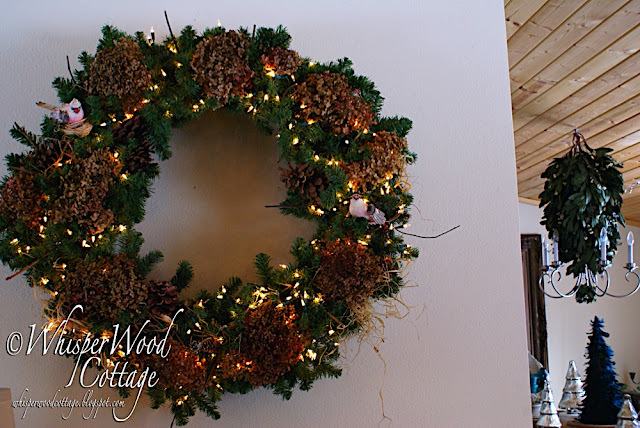 That wreath is so pretty and a perfect winter decoration! I love hydrangeas fresh and dried! So sweet! I love it! Hydrangeas have to be one of my favorite flowers- they are just 'classic' Tulips, too! Hi I'm glad to have found you and am now a follower. I have one of those sad looking wreaths in my garage right now. Love hydrangas. I crafted a wreath this week too. What fun! I'm so glad that you joined my (tiny) little party! Thank you so much! I am loving the wreath, I don't know what it is about fixing something ugly into something beautiful that sets my heart a'beating but I just LOVE to see what a little work can do! Cool idea! Love the way you totally altered the tacky original into something stylish! 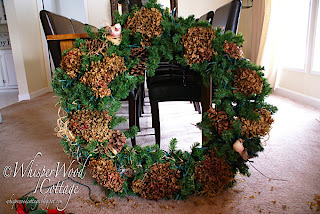 I have been on a wreath re-modeling spree myself, lately, so this was right up my street, when I saw it linked at Remodelaholic! Thanks! This looks great. I love dried hydrangeas. Very creative winter decor! An absolutely lovely creation - kudos to you! Thanks so much for linking up to my first linky party. Beautiful wreath!